Lawn Dogs, starring Sam Rockwell and Mischa Barton, is a drama film with a light element of fantasy and folklore. The movie is a story about a blue-collar worker and it has a valuable amount of social and cultural commentary that makes you think. 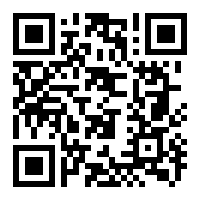 Especially for those that can either identify with the main characters Trent and Devon and the overall feel of the film. 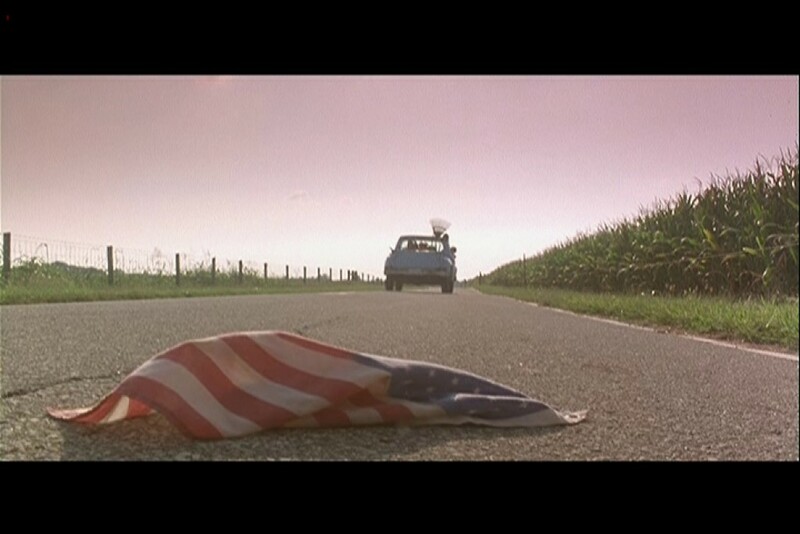 The social commentary also effortlessly extends to the soundtrack of the film. Which includes Bruce Springsteen's, "Dancing in the Dark" and Bob Dylan's, "Knockin' On Heaven's Door". Lawn Dogs is about the day-in-and-day-out life of a seasonal worker and day laborer, Trent Burns, who works at the affluent gated community of Camelot Gardens. Within the confines of Camelot Gardens, he works odd jobs and seasonal work to get by. Some of the money that he makes working in the gated community goes to help his aging, retired parents who live in a trailer park. Trent saves money by living as a land squatter in a beat-up trailer in the woods. A trailer that's located some miles from the gated community where he works. Though his squatter status is more related to his inability, as an odd-job worker, to afford actual rent near where he works. Trent, like others who do outdoor work within Camelot Gardens, is treated poorly by the community's residents. Their poor treatment is, of course, due to their 'outsider' status amongst the snobbish, self-centered and morally corrupted residents of Camelot Gardens. 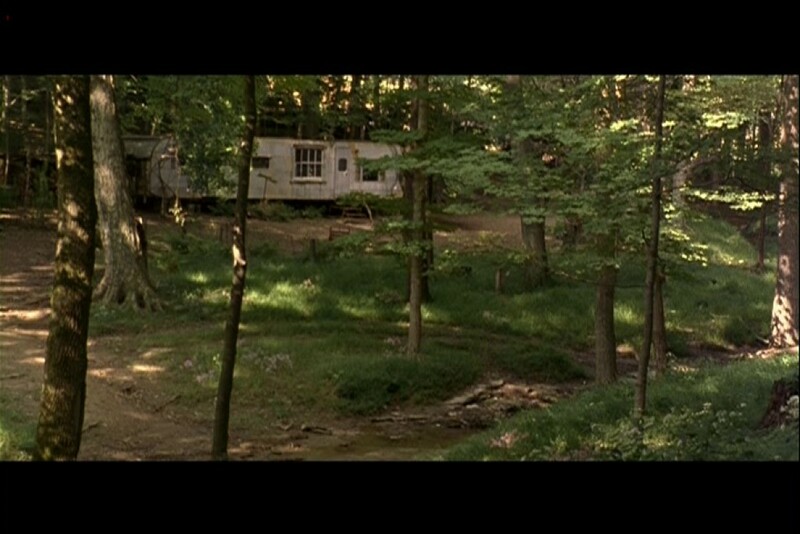 Trent's trailer in the woods. As the film progresses, Trent meets Devon Stockard (Mischa Barton ), a girl who lives within the gated prison walls of Camelot Gardens, as she's out trying to sell cookies. Their first meeting is actually when Devon finds his trailer empty, aka Baba Yaga's house, and curiously begins to snoop around the place,.rent arrives back home and is a bit startled when he finds her in his trailer. He steps back off the trailer steps, closes the trailer's door, and sits outside, waiting for her to come out. 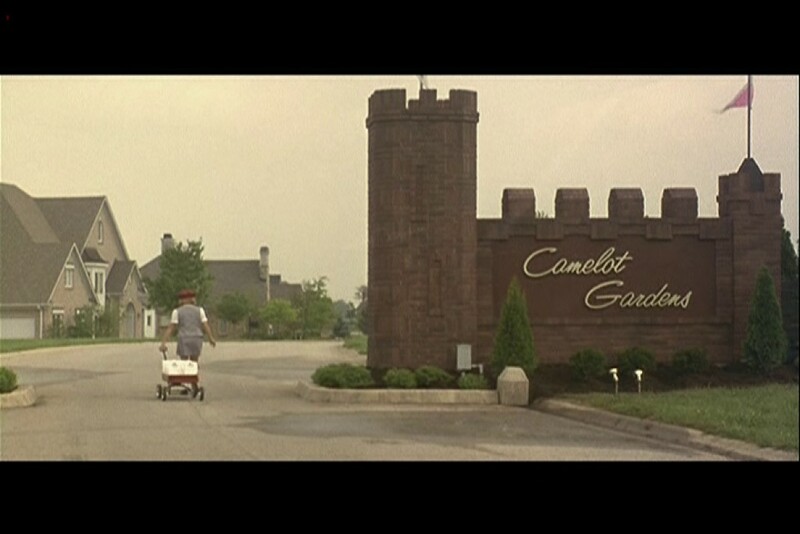 As the story deepens, we find out that Devon's father is one of the more well-liked residents of Camelot Gardens. He's a social-climber of sorts, influenced by his unfaithful wife, that even uses his daughter to try to gain influence in the community. But Devon, like Trent, feels like an outsider within the confines of Camelot Gardens. Yet her reasons are a little different from Trent's. 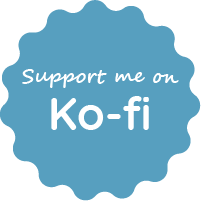 Partially based in that she's an outsider in her family and a new arrival to the community, she doesn't get along with the other children in the neighborhood. Nor does she ever want to. As for the adults in Camelot Gardens, she doesn't care much for them either. Throughout the film, you'll see the similarities between Trent and Devon becoming more apparent. They both enjoy the freedom of the open and don't enjoy the stifling, inclusive atmosphere of the community within those gates. A place that produces the most upstanding citizens, in illusionary terms, who are little more than modernly liberal and cultureless. Liberal in that what's done within their class, no matter how deviant or disturbed, is perfectly acceptable. But the smallest things done by those outside their "class" is completely worthy of punishment from Camelot Garden's residents. In that, is where Devon and Trent are completely separate from the classist community. They prefer the openness of the world versus the stagnation, isolation, arrogance, and "safety" of Camelot Gardens. Looking deeper into the story of Lawn Dogs, Devon begins to see Trent as a sort of father figure, in a way. She sees Trent as nowhere near as distant, 'normal' and cold as her robotic father. Unlike Devon's father, Trent doesn't see her as a way to get ahead in the community of Camelot Gardens. Nor does he treat her like she's a lesser person. Devon's mother, who is just as distant, treats Devon the same way her father does. Both of her parents see her as a burden but try to offset this by using her as just another way to get ahead. Not once truly caring about her hopes and needs. Furthermore, both of Devon's parents are a bit embarrassed by her. This is because of how she differs from the residents, the children, and the adults, of the community. Both of her parents have put her in a position where she's like an object to help them get to the top of the community's social circles. Due to this, Devon has a mutually distant feeling towards both of her parents and the people of the community that she's unable to relate to. She, like Trent, feels like an outcast of sorts, and in feeling alone, she wants someone to relate to. She is someone more 'free-spirited' and feels more at home in the open and unrestrained. Like Trent, she prefers the wide-open freedom to the stagnation and the false safety within the gates of Camelot Gardens. As for Trent, it's evident that, given a few events in the film, he's looking for someone to show concern for him. That is, besides the care and concern he gets from his parents. Of course, that's now how it initially was since it was Devon who, in an unorthodox manner, introduced herself to him while she was out selling cookies. A lost boy looking for his way, with a weight upon his shoulders. Trent, he also looks for someone to care about and relate to. A 'girlfriend', Pam, a friend with benefits form Camelot Gardens, brushes him off on numerous occasions in the film. The brush-off happens as Trent makes it clear that he wants to get to know Pam better and be introduced to her family. In the storyline, the rejection he feels is where Devon comes in. Her character fills that void, being like a daughter to him, and makes him feel less alone in the world. When Trent brings Devon to his parents' house, it reveals a side that wants his parents to be proud of him. It's also about Trent trying to bring a little more joy and brightness into his parents' lives any way he can. Most everything he does is for his parents. 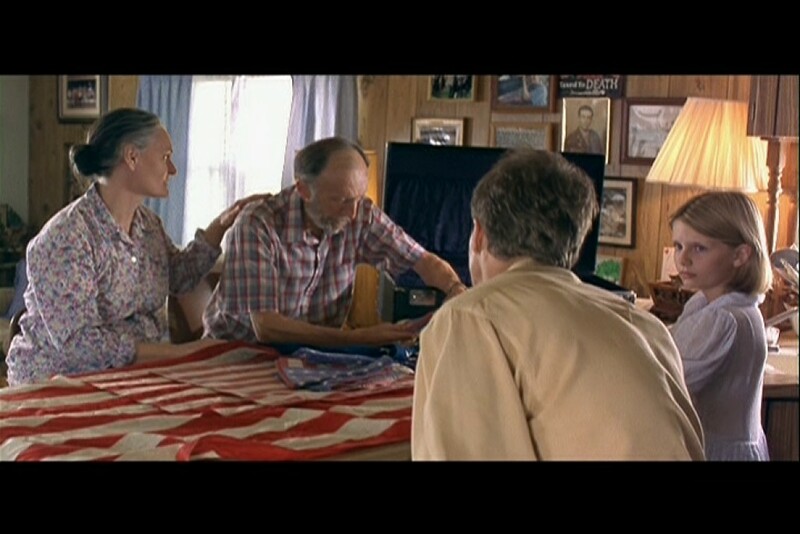 It is in these scenes where we find Trent becoming upset by the reality that his father isn't doing all that well, health-wise. Without spoilers, these scenes are definitely amongst the best of the film. After the visit to his parents, on the ride back towards Camelot Gardens, Trent begins to see Devon as someone he can open up to about things. Devon becomes someone to talk to about his father's disease and other problems. Which are the things that Trent usually keeps bottled up because he had no one to talk and had no one, other than his parents, that took him seriously. In this, Devon becomes like a family member, the daughter figure, and he takes on a role of being a father figure of sorts. Devon, in turn, shows her appreciation as she doesn't get that from her social-climbing father. Later on, we see that in her defense of Trent over her father, and against the others of Camelot Gardens, proving that she sees Trent as more worth protecting. Even over her own father. When I first saw this film, sometime around 2000, the story pulled me in from the start. 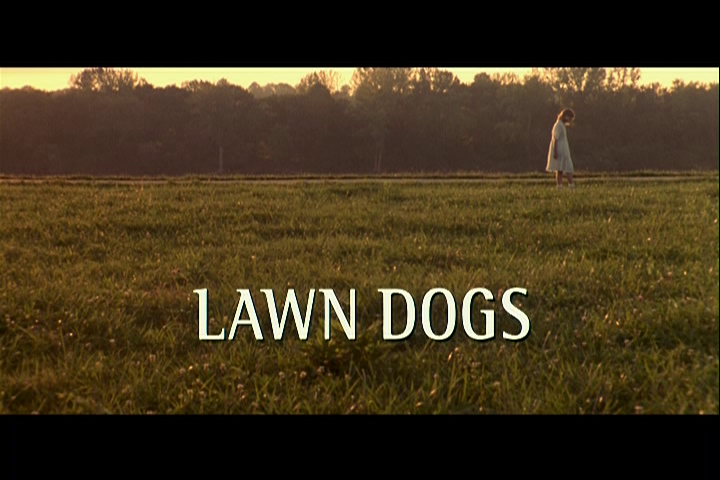 Lawn Dogs was such a memorable film that even years after forgetting its name I still remembered the story. Years later, I randomly came across the film again on Hulu, on Christmas Eve of 2009, and it was like a gift I wasn't expected. Then I purchased the DVD within the following weeks. In my opinion, Lawn Dogs is one of the films that you'll want to watch again and again. Maybe once or a few times a year. Its lesser-known status and low popularity does make it a "gem" of sorts. It is definitely a film that everyone should see at least once. It's a relatable film and is similar, especially given the base story of Trent's life, "class", and that of his parents, to many of our lives and our circumstances. Another aspect of this film that makes it enjoyable is the simplicity of Trent's life. Yet, at the same time, his life is far from being as simple as it appears to be on the surface. The difference in his "social class" from those in Camelot Gardens has him sticking out like a sore thumb when he enters Camelot Gardens to put in a day's work. The community's residents look down on him for being blue collar. Yet, Devon sees him and looks at him, and his character, as someone new who is worth looking up to and getting to know. Almost like she sees him as a symbol of freedom in the middle of the 'prison' of Camelot Gardens. A community where her parents just happen to be the 'fine, upstanding citizens'. Even though they are anything but. Add that to the fact that Devon doesn't identify with the kids her age in Camelot Gardens as she says, they "smell like television", only it brings out more of her dislike of the confinement in the gated community. Both Devon and Trent have a sort of resentment of how their lives are but don't let it make them bitter. In that, it is what makes their characters similar from the beginning. It's their natural need for freedom, a spirit alive in the both of them, which makes Devon and Trent very much alike. Anyway, that's my take on the film Lawn Dogs. It's one of the rarer films that's worth seeing for those who have never seen it before. It's also likely that you'll end up wanting to watch the film more than once to take in the full story. The fictional McCade County (spelling?) is where Camelot Gardens is located. Though, in some sources, the county is either McKay or Mackay. 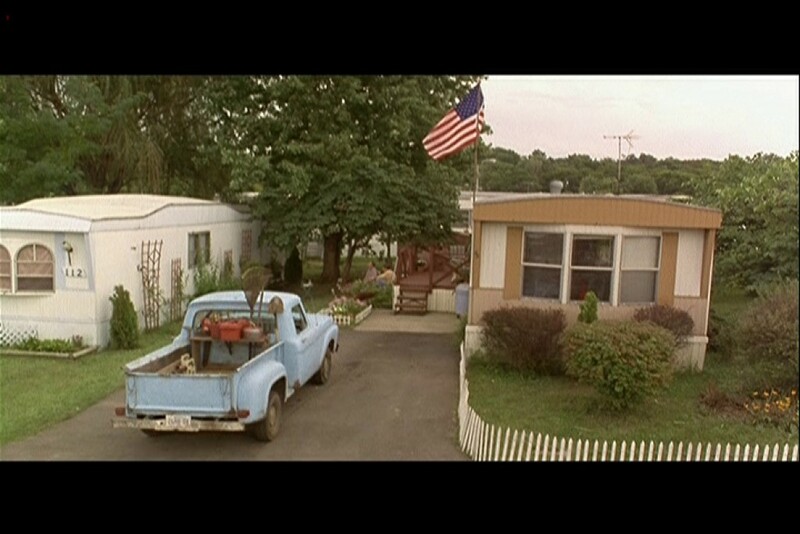 There are references to McKay near where Lawn Dogs was filmed in Kentucky. Though it sounds like "McCade" when Devon says the fictional county's name. 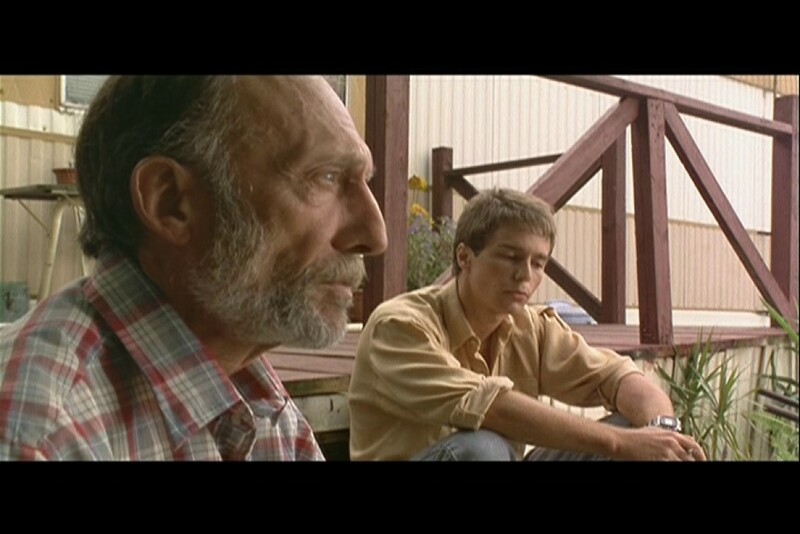 Sam Rockwell, Bruce McGill, and Beth Grant all starred together in the 2003 film, "Matchstick Men". Sam Rockwell and Bruce McGill star together in the 2019 film, "The Best of Enemies". 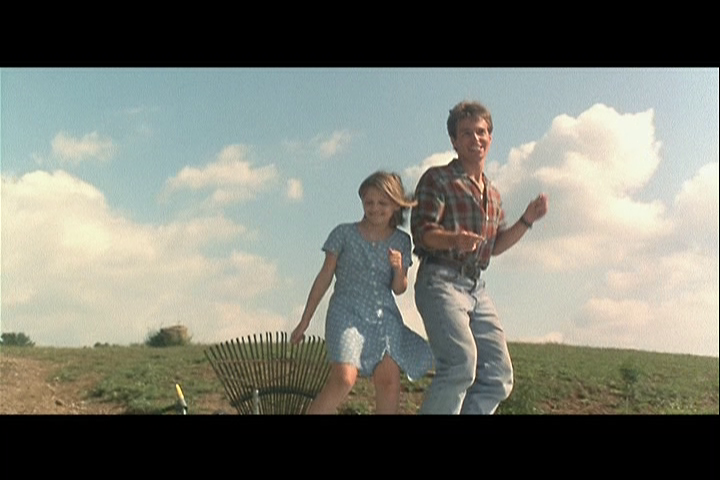 Lawn Dogs, a 1997 drama/fantasy film, tells the story of a girl, Devon, from a gated community and Trent, who works as a laborer in the community.